If you think you’re too old to learn how to swim, you don’t know what you’re missing. Once upon a time, I too feared the water. I remember being in the baby pool, equipped with the double safety measure of a doughnut-shaped float and inflatable armbands – if anyone so much as suggested that I removed them, I’d wail at the top of my voice. Perhaps that was why my parents hurriedly sent me off for swimming lessons. The next thing I knew, I could dive to the bottom of a five-foot-deep pool and emerge smiling. I was five. As I grew older, I was surprised to discover that many of my friends and colleagues couldn’t swim. It didn’t matter that the cerulean waters spelled tranquility; none even tried. As lot of adults don’t swim not because they lack the willpower to do so. Often, the idea of wearing an unflattering thigh-exposing swimsuit is enough to put people off. And then there’s the paralyzing fear of drowning, a risk absent in a game of ping pong, golf or badminton. For a 45-year-old engineer Makbol Ahmad Mohamad Omar, it is the uneasy feeling of being watched. “Whenever I’m at a swimming pool, I would feel everyone’s eyes staring at me. It’s as if people know I can’t swim,” he says. That would have been the case just a month ago, but after engaging the services of Aeroswim instructor Daniel Goh, Makbol is a lot more confident these days. “I used to live by the beach in Port Dickson. I could splash around in the water, but that was it,” he recalls. When his eldest son turned 17, Makbol felt that it was time everybody in the family learnt how to swim. “When you’re 17, you learn how to drive. It should be the same with swimming,” he says. While Makbol is still struggling to stay afloat and synchronise his movements in the water, he finds swimming a great “stress-reliever.” “I regret that I didn’t take up swimming 15 years ago,” he says. Makbol has not only learnt how to swim from the weekly lessons – he now also shares a greater bond with three of his eldest children. “The lifestyle of today offers very limited interaction between people; everyone’s always on Facebook or Twitter. After my kids and I took up swimming, we’ve grown much closer,” he says. At times, swimming is perceived as a sport only for the young, lean and flexible. But according to Goh, 58, the water doesn’t discriminate. “It doesn’t matter what age you are, what profession you’re in or what level of intelligence you have – everybody can swim. It’s a matter of giving yourself time and confidence,” says Goh, who thinks there are still many, both the young and the old, who don’t know how to swim. 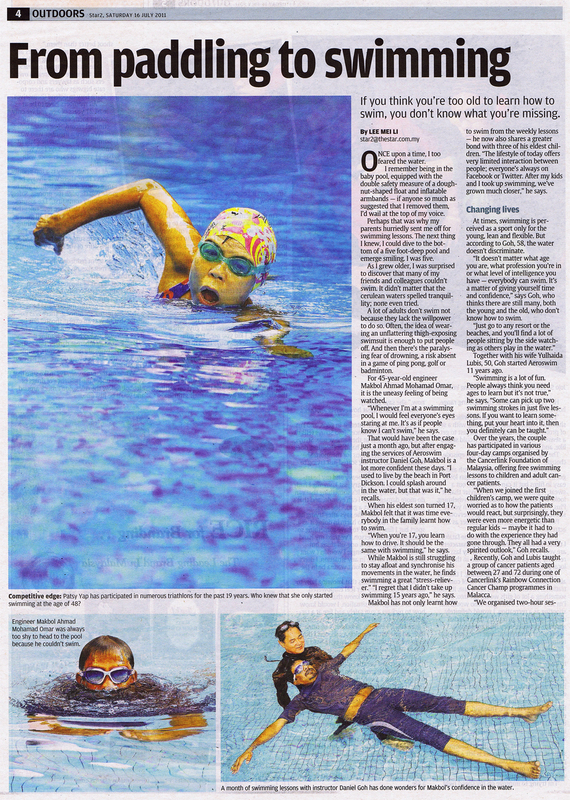 Together with his wife Yulhaida Lubis, 50, Goh started Aeroswim 11 years ago. Over the years, the couple has participated in various four-day camps organised by Cancerlink Foundation of Malaysia, offering free swimming lessons to children and adult cancer patients. “When we joined the first children’s camp, we were quite worried as to how the patients would react, but surprisingly, they were even more energetic than regular kids – maybe it had to do with the experience they had gone through. They all had a very spirited outlook,” Goh recalls. Recently, Goh and Lubis taught a group of cancer patients aged between 27 and 72 during one of Cancerlink’s Rainbow Connection Cancer Champ programmes in Malacca. “We organised two-hour sessions over the course of four days. By the end of the camp, alot of them managed to pick up basic swimming techniques,” says Goh. The oldest student Goh and his wife have ever taught is an 82-year-old man. “After a few classes, he could float and stand up in the pool comfortably without fumbling. That was quite an achievement for us,” he remembers. For 68 years of her life, Chan Yuet Ngo feared the water. No particular reason really, just the fact that she never did learn how to swim. She lives in a condominium where a 25m pool lies waiting. If her grandchildren wanted a swim, Chan would gladly wait for them by the benches, often concerned for their safety. “How could I watch over them if I couldn’t even swim?” she asks. That was four years ago, but Chan finally took the plunge and stepped into a swimming pool for the very first time, with the help of Lubis. “My son, my daughter-in-law, my grandchildren – all of them could swim. I felt that it was a waste that I didn’t,” says the former cleaning services supervisor, now 72. Chan breezed through her first three swimming lessons. “I thought it was easy enough because I only had to learn the breathing techniques. But during the fourth lesson, I panicked – Madam Yul (Lubis) wanted me to walk around the pool. She led me to the middle – I was so scared! I almost gave up learning there and then,” she recalls. Chan then asked Lubis: Would she ever be able to swim one day? These days, Chan swims at least twice a week. A lot of Chan’s friends, though, are apprehensive about swimming. “I’ve asked them to join me many times but they seem afraid. They probably think it’s not a necessary sport to learn,” she shrugs. For the past 19 years, Patsy Yap has participated in numerous triathlons. Yet nobody would’ve guessed that she only began swimming at the age of 48. 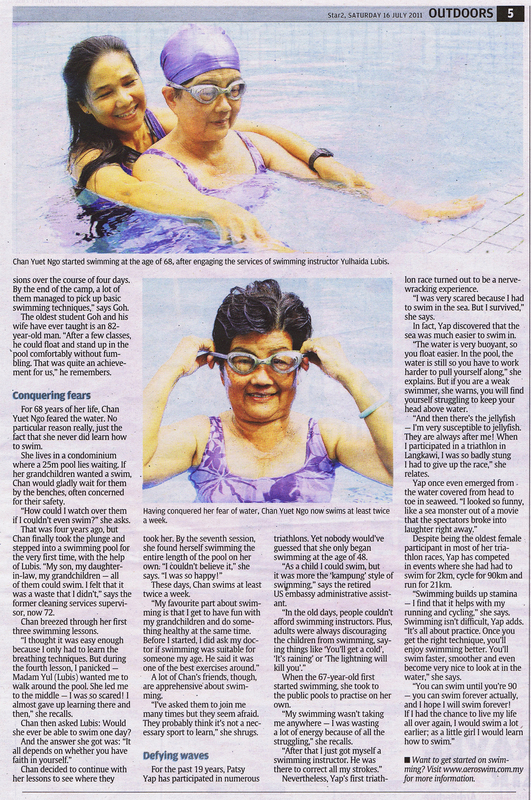 “As a child I could swim, but it was more the ‘kampung’ style of swimming,” says the retired US embassy administrative assistant. When the 67-year-old first started swimming, she took to the public pools to practise on her own. “My swimming wasn’t taking me anywhere – I was wasting a lot of energy because of all the struggling,” she recalls. Nevertheless, Yap’s first triathlon race turned out to be a nerve-wracking experience. “I was very scared because I had to swim in the sea. But I survived,” she says. In fact, Yap discovered that the sea was much easier to swim in. “The water is very buoyant, so you float easier. In the pool, the water is still so you have to work harder to pull yourself along,” she explains. But if you are a weak swimmer, she warns, you will find yourself struggling to keep your head above the water. “And then there’s the jellyfish – I’m very susceptible to jellyfish. They are always after me! When I participated in a triathlon in Langkawi, I was so badly stung I had to give up the race,” she relates. Despite being the oldest female participant in most of her triathlon races, Yap has competed in events where she had to swim for 2km, cycle for 90km and run for 21km. “Swimming builds up stamina – I find that it helps with my running and cycling,” she says. Swimming isn’t difficult, Yap adds. “It’s all about practice. Once you get the right technique, you’ll enjoy swimming better. You’ll swim faster, smoother and even become very nice to look at in the water,” she says.